The fact is, hunger is everywhere. Too many people in every state, and in communities both urban and rural, do not know where their next meal will come from. Some skip meals, opting to pay utility bills or medical bills instead of buying groceries. Those living in rural areas like my hometown may drive many miles to find healthy and affordable food. Children and seniors are particularly at risk. Food banks and food pantries are critical emergency resources. From a young age, I remember bringing food donations, especially around the holidays, to our church — which operated as the food bank in our small town. My family continues the tradition to this day. Years later, I’m honored to continue this work on a larger scale. For the second year in a row, my company is offering the Wells Fargo Holiday Food Bank in a joint effort with Feeding America to fight hunger. Feeding America is the nation's largest domestic hunger-relief organization, and together we are aiming to provide 40 million meals to help people in need this holiday season and beyond. 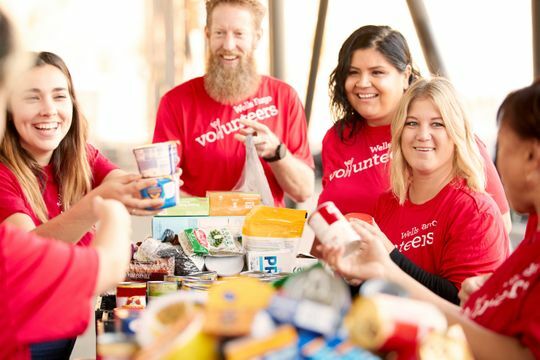 Through December 31, you can leave non-perishable goods at any of the 5,700 Wells Fargo U.S. branch locations, or at a Mobile Pop Up food bank in nine cities across the country. The top items needed, such as cereal, peanut butter and juice, may already be in your kitchen cabinets or on your shopping list. (Here’s a list of the items needed most.). Our friends at Feeding America, the nation's largest domestic hunger-relief organization, are helping us distribute the food to its 200 member food banks and 60,000 food pantries and meal programs around the U.S. Giving what you can is important, no matter how you do it. We hope you will consider donating food, volunteering with your local food bank, or making a financial contribution to Feeding America through Wells Fargo ATMs and online. Each dollar helps provide at least 10 meals for hungry people. The Wells Fargo Foundation has donated $4 million to Feeding America already this year, and we‘ll match your donations up to $1 million through the end of the year. As I donate food this season, I’ll be thinking about my own community, and making the dinner table a little more inviting for others nearby and around the country. Let’s all give what we can — and make a big difference this holiday season.